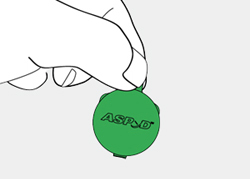 PLEASE TAKE CARE WHEN OPENING YOUR ASPOD, EXCESSIVE FORCE COULD DAMAGE THE HINGE! 3: GENTLY AND SLOWLY pull lid upwards. 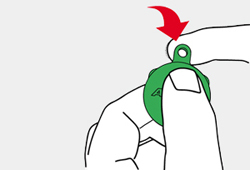 If no click is heard, hold both halves together placing thumb below eyelet, and push the eyelet forward towards you. 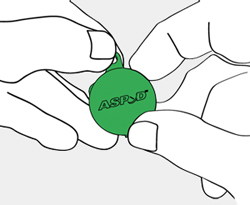 Load the Aspod® with aspirin and hold it in front of you, with the Aspod® logo facing. You will see the eyelet in the centre with two ‘ears’, one on either side of the eyelet. 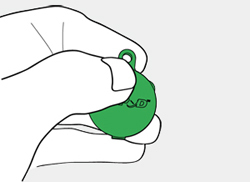 With your left thumb in front and index finger behind the left hand ‘ear’ apply pressure until a click is hear/or felt. Repeat this with the right hand ‘ear’. 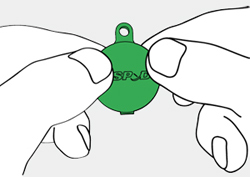 Then with index finger behind where the eyelet joins the case apply pressure to the front top of the lid with the thumb and the final click will be heard/felt – The Aspod is now locked correctly. 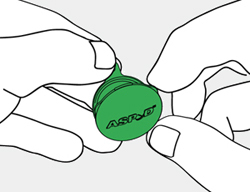 Due to the minute tolerances involved in precision moulding, the final locking click on some ASPOD's may be 'felt' rather than heard. This does not indicate a faulty product.